It's hard to go wrong with carrying a light, fast, and feature-rich tomahawk. Decked out with reflective paracord wrapped handle, ferrocerium firestarter rod in the handle, nail puller, hammering head, and sharp multi-purpose blade, the Survival Hawk is ready wherever you go. The Survival Hawk's engineering roots comes from proven designs that have been tested in the real world many times. Wherever you may roam, this is the perfect tomahawk to rely upon. HANDLE MATERIAL GLASS-REINFORCED NYLON - HANDLE COLOR BLACK. 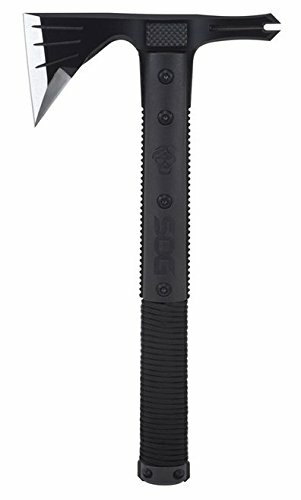 New Doomsday Skull Edition Battle Axe + Free Extra Replacement Handle - The Fight for Survival Begins Now!